Cherry sour cream muffins. Juicy, sweet, nutty. The sour cream gives them a richness that almost tastes like cheesecake. 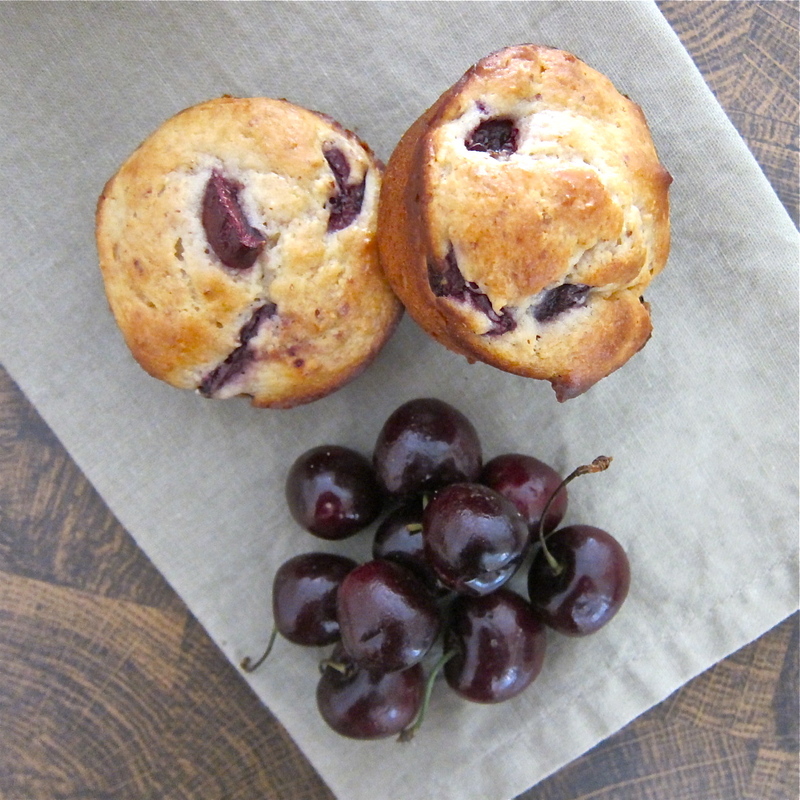 The muffin is loaded with ripe cherries that bleed sweet fruit juice with each bite. I used half almond meal and half flour to create a light crumbly texture that is buttery and luscious. I topped a few with a brown sugar almond meal crumble, I topped some with toasted sliced almonds and the others I left simple and unadorned. I loved the varitety. 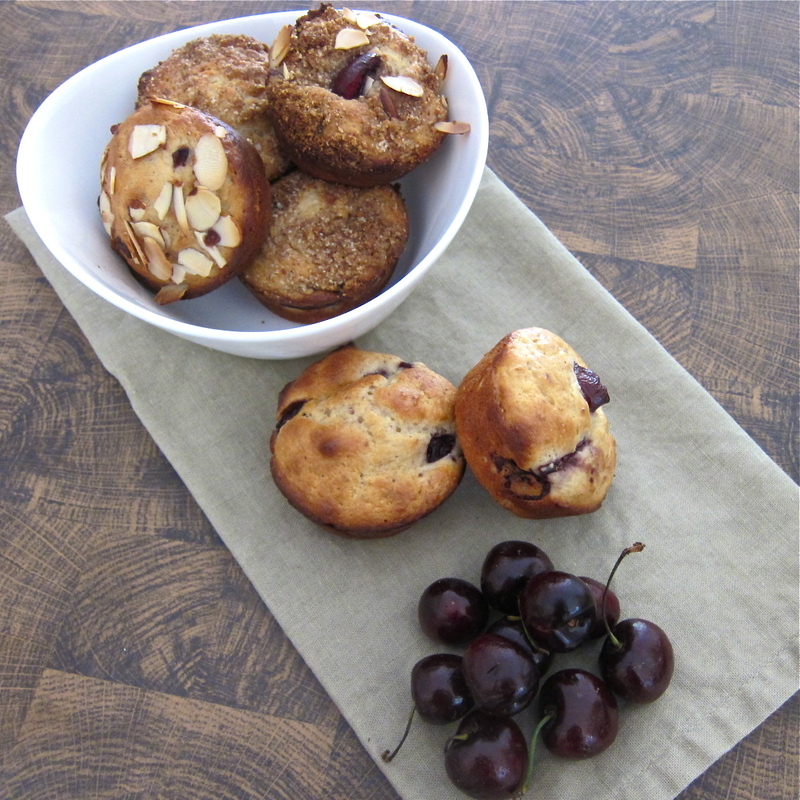 Enjoy summer cherries in muffin form! Preheat the oven to 375°. In a medium bowl, combine the brown sugar, flour, butter and cinnamon. Rub with your fingers to form coarse crumbs. Refrigerate until ready to use. Butter a 12-cup muffin pan. In a medium bowl, whisk the 1 1/2 cups of flour with the baking powder, baking soda and salt. In a large bowl, using a handheld mixer, beat the egg at medium speed until frothy. Add the sugar and melted butter and beat until pale yellow, 1 minute. Beat in the sour cream, vanilla and lemon zest until blended. Add the dry ingredients and beat at low speed until almost blended. In a bowl, toss the cherries with the remaining 1 tablespoon of almond meal. Using a rubber spatula, fold the blueberries into the batter. I need to get my sour cherry situation on! I dig the almond meal topping. These look so good. A little obsessed with cherries right now. theletmeeatcake.com is the perfect blog for anyone who wants to know about this topic. You know so much its almost hard to argue with you (not that I really would want…HaHa). You definitely put a new spin on a subject thats been written about for years. Great stuff, just great! I love cherries! And these muffins look fantastic! Wow, I love love cherries but never thought of putting them on muffins! What a great recipe and fantastic blog! Found you coz I was googling Filipino food! Amazing recipe. I used yogurt instead of sour cream and sour cherries. Oh and walnut meal(bc that’s all I had). The fam gobbled them right up! Thanks for sharing!! !